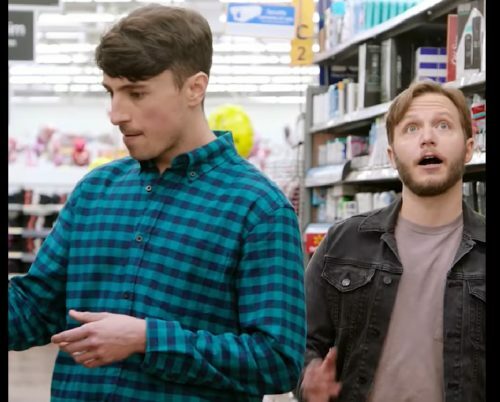 An anti-LGBTQ hate group is up in arms over a gay video produced by Walmart. Walmart has a series that it’s promoting on its Facebook page called Love is in the aisle: A dating show at Walmart. The videos show people going on blind dates at Walmart. The second episode is about Pat and Andy, where they shop and joke around and Andy asks if 3-in-1 shampoo/conditioner/body wash actually contains all three of those products. Cute and a little weird, nothing anyone could get upset about…. “I honestly never thought Walmart would join the cultural revolution and reject the beliefs of its customer base,” Tim Wildmon, president of the American Family Association, wrote in an email blast. Which gives away the game. A lot of homophobes pretend that they don’t really hate LGBTQ people, they just think that straight marriage is sacred. But the Walmart video says absolutely nothing about marriage. It just shows two men making jokes about pans and enjoying each other’s company. It’s almost like these folks don’t care at all about the sacred institution of marriage and just hate gay people. “At least with a company like Amazon, we knew they were liberal from the outset,” Wildmon wrote. The AFA has a petition up and is telling people to call Walmart’s customer service to ask them to “remove the pro-homosexual video and remain neutral on controversial issues,” such as whether gay people are allowed to exist. They claim to have over 35,000 signatures on the petition.